KOKOMO, Ind. – With 152 of the strongest and fittest athletes in the nation in Kokomo, Chad Coy and Club Fitness 24 hosted its 17th Annual Central USA Strongman competition. The event has grown into one of the largest – and oldest – in the nation. Coy said the event is an event that athletes want to participate in, year in and year out. It is also a small boon to the local economy, something he is proud of. One draw is the fact the Kokomo event has a strong history. In fact, it is one of the oldest in the country. 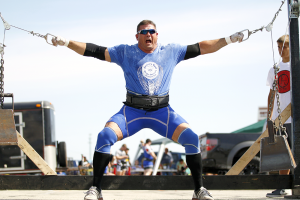 Coy – who has won in his share of events and is a previous competitor for America’s Strongest Man – said he ran the idea through the American Strongman Corporation, who endorsed the new concept. Plans are already underway for version 18 of Central USA Strongman and the fourth edition of the masters competition, which Coy said will be bigger and better than the previous 17 – something he is proud of as a leader in the Strongman universe.